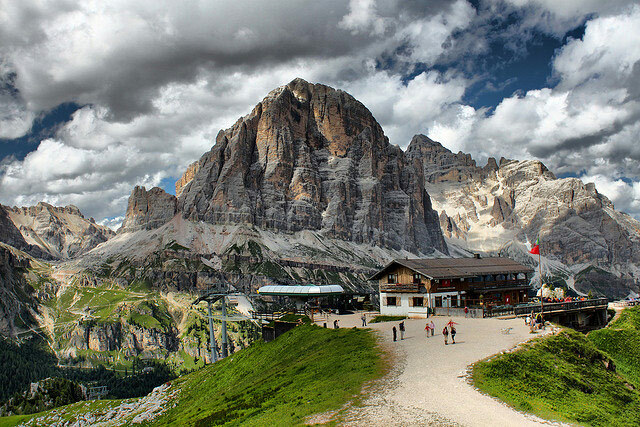 The Cinque Torri are a small moutain group in the Dolomites, located on a grassy hummock at circa 2200m, between Passo Falzaregoto and Cortina d’Ampezzo. Tofana di Rozes & Rifugio Scoiattoli. Photo © Daniele Ceccato. Reproduced with kind permission of Daniele Ceccato. 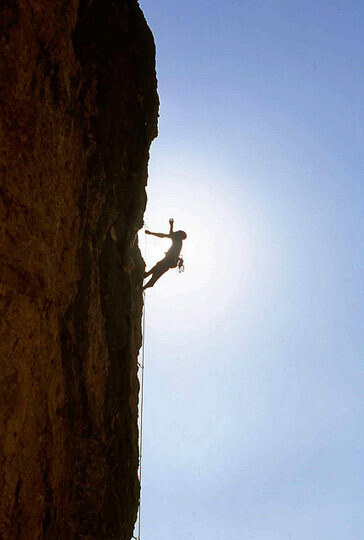 They are famed as a beautiful, natural photographic location and for their short climbs of varying difficulty levels. 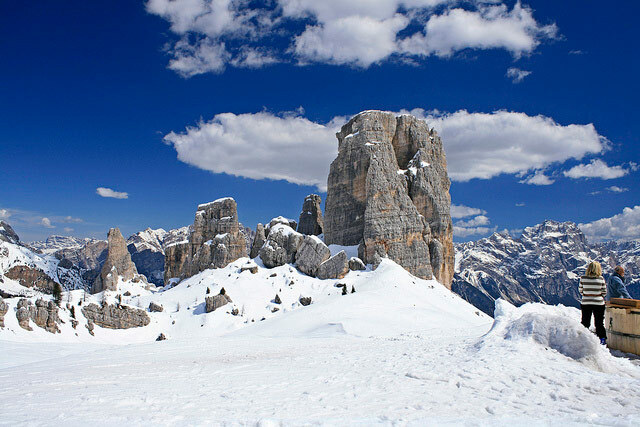 The Cinque Torri are also a beautiful area for hiking excursions in summer and fantastic skiing in winter. 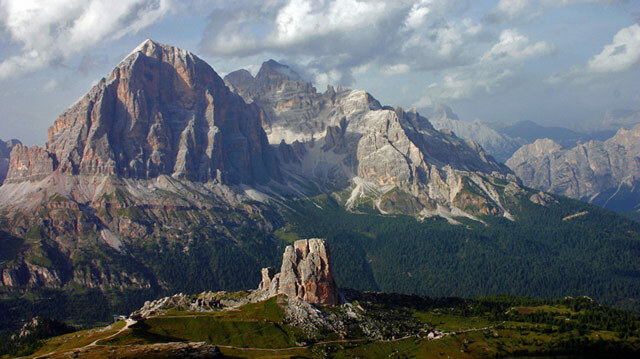 Cinque Torri (in the foreground) viewed from the Nuvolau Peak. In the background the Tofanas. 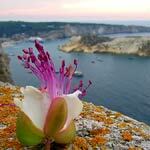 Photo by Pear Blossom. 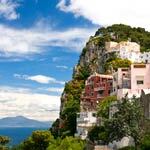 The mountain group consists of five steep tower-like mountains (hence their name). 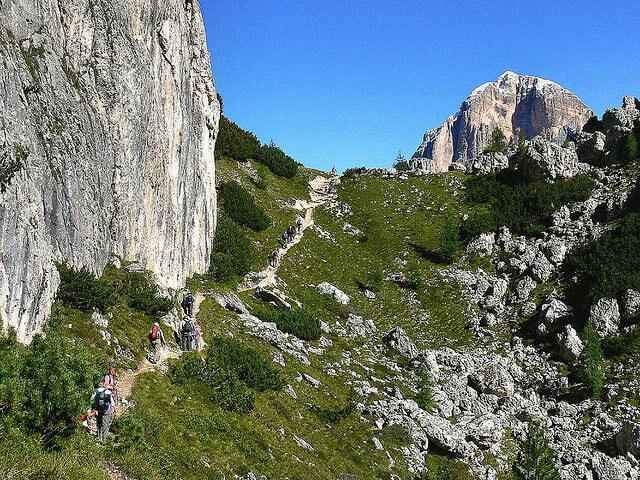 The highest of the five, the Torre Grande, offers three very appealing peaks for rock climbers: Cima Nord, Cima Sud e Cima Ovest. Culminating at 2361 meters, the south summit is the tallest. 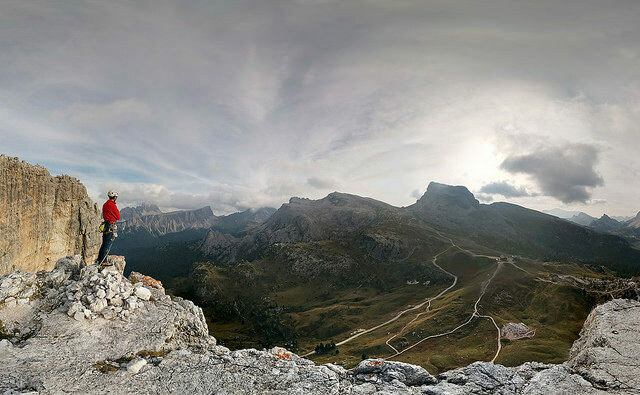 View form Torre Grande, Cima Sud. Photo © Stefano Roverato. 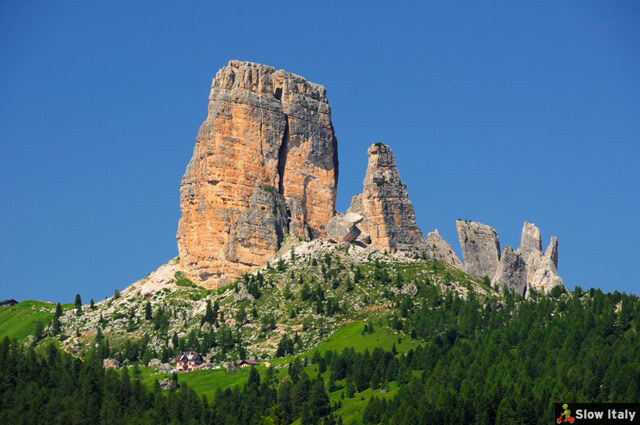 The Torre Seconda consists of three distinct peaks called Torre del Barancio, Torre Romana and Torre Lusy, The third one, Terza Torre, is also known as Torre Latina. The fourth “tower”, Quarta Torre, consists of two blocks of different heights, respectively called Torre Quarta Bassa and Torre Quarta Alta. 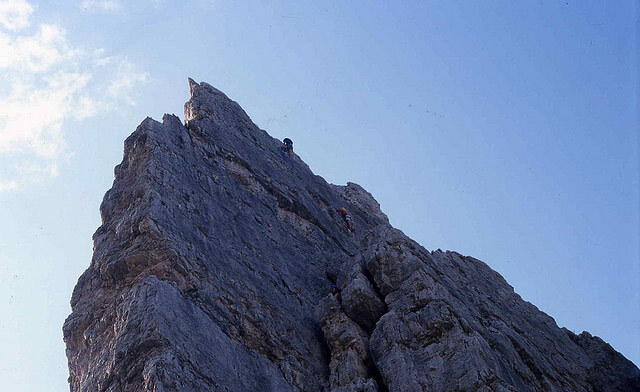 The Quinta Torre (or Torre Inglese) offers various single pitch routes. 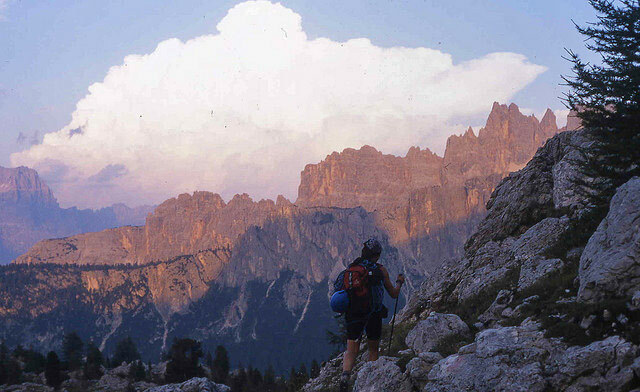 Hikers on Cinque Torri trail. Photo by Bill Stanley. 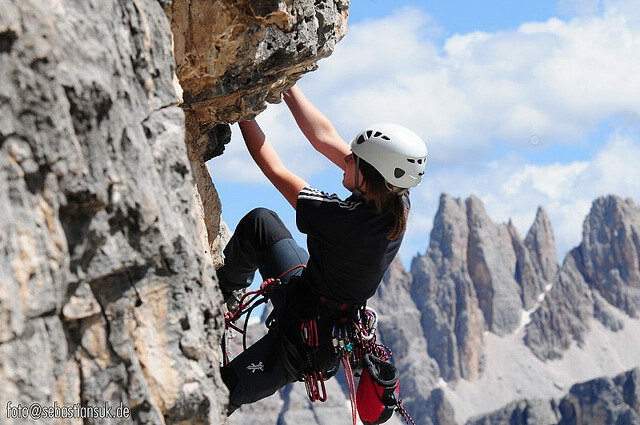 With their 130 routes and wonderful collection of spires and pinnacles set against a stunning backdrop, the towers provide good rock climbing possibilities of varying difficulty levels, ranging from easy-to-access sport climbing routes to the classic multipitch routes. 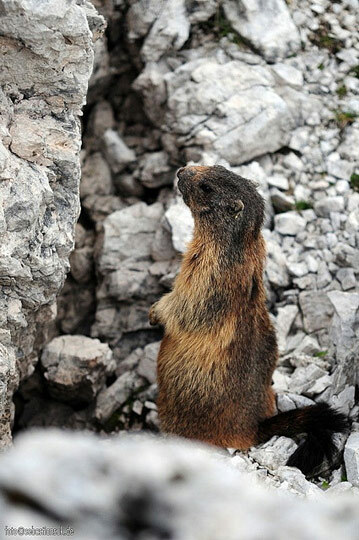 You’ll find the following rifugi (mountain huts) in the Cinque Torri area: Rifugio Cinque Torri (2,137m) and Rifugio Scoiattoli (2,255m), Rifugio Averau (2,413 m) and Rifugio Nuvolau (2,574 m). 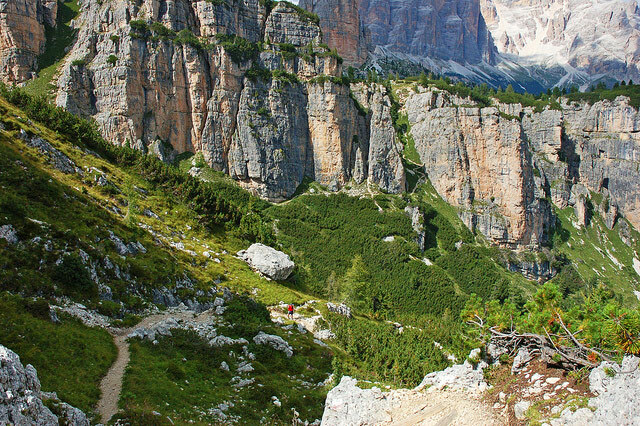 Path 443 from Passo Giau to Rifugio Cinque Torri. Photo by Richard Jones. 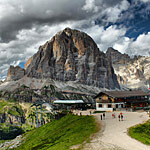 Photo credits (top to bottom): Cinque Torri © Samuele Gallini/Fotolia.com; Cinque Torri view by Pear Blossom; Cinque Torri view from Cima Sud by Stefano Roverato; Cinque Torri hiking and rock climbing (3 photos) by Aitor Salaberria; Cinque Torri hiking by Bill Stanley; Cinque Torri marmot by Sebastian Suk; Cinque Torri snow by Vittorio Ferrari; Cinque Torri rock climbing by Sebastian Suk, Path 443 by Richard Jones.